The Number One Recipe or It Doesn’t Get Better Than This! Excuse us for living, but everyone has a favorite dish or recipe that is No. 1 in their book and Spaghetti and White Clam Sauce is No. 1 for us! This first PastaPost is a follow-up to the recent blog post, “The Story of ’Friday Night’!” (Click on that one if you missed it!) There, I described how every Friday night, all the years of our married life, my wife, Geri, and I have a romantic dinner for two by candle light, a bottle of wine, and a favorite pasta dish. There, I promised from time-to-time to share a favorite recipe with a PastaPost. But how can I resist telling you about the origins and history of our little recipe? (That’s a warning! You may want to skip down to the recipe right now!) It all started when I was a teenager growing up in Paramus, NJ. The Fontanas cheated and did not make a famous old Sicilian recipe from “la famiglia.” They, like so many others did for convenience, opened up a can of Progresso White Clam Sauce. It was OK but nothing like “the real thing.” Even back then, I had the “itch” for something better. And so, when “Mom” was not around to make dinner one night (a very unusual occurrence in our home in those days), I “doctored up” a can of Progresso by frying up some extra garlic in oil and added it to the mix. The word from “Dad” to “Mom” was, “I like the way Phil makes the clam sauce.” –This was like “peccato,” sin, committed in words from my father’s lips and “disgrazia,” disgrace, for my mother! And so, it was that same “doctored Progresso” that I made for my fellow draftees in Vietnam in 1970. I wrote home with explicit instructions re what I needed for a nice antipasto and my version of clam sauce. The care packages were not far behind. My GI buddies had a feast! Fast forward to 1972. Geri and I were married that Labor Day weekend and moved to our new apartment in Morristown, NJ. 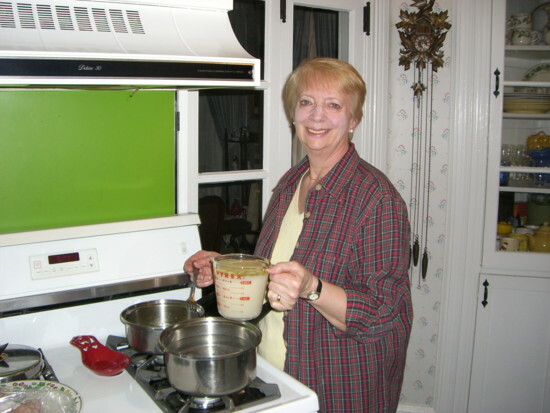 It was there that Geri and I concocted our first recipe on a Friday night for spaghetti and white clam sauce. It was very simple back then: oil, garlic, onion, a little oregano, red pepper, parsley, salt, and, of course, clams, and boil up the pasta. We got a lot of mileage out of that recipe. Within a year, we were moving to a Drew University efficiency apartment as a grad student. And, before I knew it, I became a social studies teacher in a local middle school. –My dream come true! Again, a year later we moved into our first house. But there were still a few months left on that Drew U efficiency lease! So, most of the men on the faculty and I put together a “stag party” of card playing, plenty of beer, wine, clams on the half-shell, and, you guessed it, spaghetti and white clam sauce. That clinched it! The principal declared that Geri and I had to cook clam sauce at his beautiful carriage house for the men faculty and their wives, 20 some people. – 6 lbs. of vermicelli pasta, in cafeteria size pots, 48 oz. of oil, 6 bulbs of garlic, and 14 6 oz. cans of small clams and the recipe was “famous”! To this day some 35+ years later, some of those friends and family still use and swear by that original recipe. Others have followed our lead as the recipe has evolved. –First, Geri added white wine to the recipe many years ago. And then the pie`ce de resistance, Geri added butter and chicken broth. Over the years we would order spaghetti and clam sauce occasionally in restaurants. We were always disappointed. We finally asked ourselves why are we torturing ourselves, to say, “Our recipe is better?” So, we stopped ordering clam sauce “out” and save it for one of our Friday Nights! 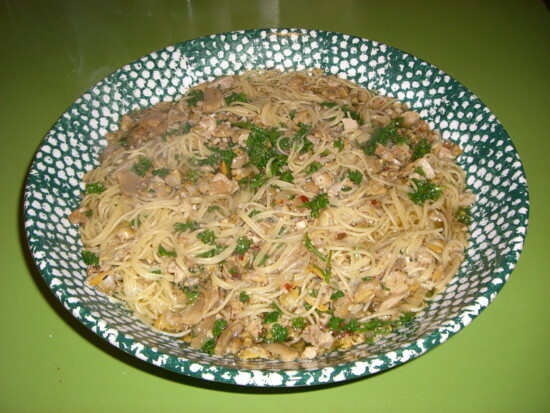 …Spaghetti and White Clam Sauce! Drain liquid from the two cans of clams and reserve. Heat oil in a medium sauce pan. Add onion and garlic; sauté until tender, 3-5 minutes. Stir in butter, wine. chicken broth, oregano, red pepper and reserved clam juice; simmer uncovered about 30 min. Add drained clams and parsley to sauce and heat gently. Cook spaghetti in boiling salted water until al dente. Drain in a colander. Serve with sauce. *Optional: Not our preference, but you can substitute 1 ½ doz. Littleneck or Topneck clams for the canned clams. However, then also add 4 oz. bottled clam juice to replace reserved clam juice. Canned clams do it all for you, plus you get plenty clams in the pasta with consistency! Excuse us for living, but it doesn’t get better than this! yum my favorite pasta dish, Can’t wait to try your recipe. So many intersecting circles of life, all the more precious as we grow older–I have just gone to my recipe box and have in my hands the original “Spaghetti and White Clam Sauce di Fontana” recipe, typed on its mimeographed sheet of paper. Much used and much loved since I’ve had it. First enjoyed in one of my August visits to Phil and Geri in the mid-1970’s. Rich, That story & your recipe box & the mimeographed sheet will be hard to top by anyone! When the subject comes up, we remember plying you with clam sauce & pasta when, we learned, your dietary needs called for more protein! So OUR memory goes like this, “Remember when we almost killed Rich?” Ha! Now, I am in the same boat &, thus, a little steak for protein before a pasta on Friday Nights! Great story, great memories, great recipe box! You deserve the new recipe for that! Phil & Geri right here too! Yummy! Looks absolutely amazing! Can’t wait to try it……Excuse me for burping! Phil, Gene and I remember the now-storied mimeographed sheet with the original recipe, which was delicious. Then one day Gene came home from work excitedly waving a copy of the new and improved recipe – absolutely wonderful! We’ve made it for friends and family, and everyone love it. You and and Geri are right. We don’t ever order this out because it’s just not as good. Thanks for sharing! Ginny & Gene! Yes, our first reply from the Florham Park crowd!!!! Love it & could not wait to see who would be first! Yep, the original recipe to the updated one! And Gene always said you both got a lot of mileage out of the recipe! We were never sure how many rewrites/revisions we did on ditto or mimeograph…& if the butter & chicken broth “made the cut” to all of you. And what a laugh re you guys doing the same in not ordering it in restaurants! We were slow on that one! Thanks so much. Phil & Geri right here too! You are so right brother and Geri. Thanks to our Italian roots and Mom’s “gifts of recipes” embellishing on Mom’s Italian cuisine has kept us out of Italian Restaurants. We would like to add to the list of clam sauce lovers who have sampled your superb sauce…..deliziouso !!! You are our inspiration to mangia linguini and clam sauce domani. Vin & Don, Yep, Mom started it all with so many good dishes! And true, when we ARE in Italian restaurants we are always comparing to home. 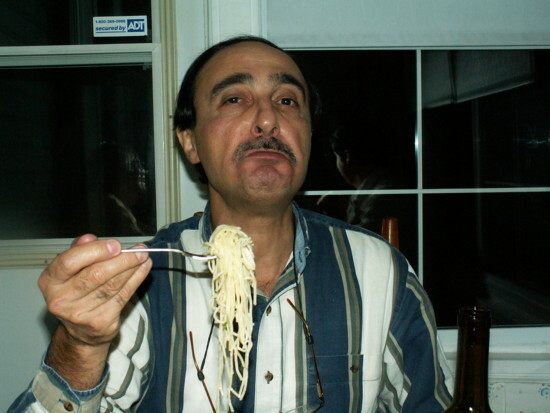 Vin, you would not believe how popular a topic “Pasta” is!!! This is my biggest first day Post so far re “hits,” last I checked already at 106 in its first day. And between the comments above & e-mails received, unbelievable! Rich Bower, Rutgers Glee Club alumnus, e-mailed us a 35+ year old purple ditto copy of our first recipe for clam sauce! And that was a real fun Friday Night we had with you both last year with clam sauce!!! So mangia domani!!!!! Phil & Geri too! Yum! Very excited to give this a try. Thanks for sharing your tried and true recipe with us. Jim says he is going to cook this for me…lol…actually Jim is a good cook-but he needs to not use butter(allergy)….keep them recipes a-coming phil! Marg, You’ve spoiled me…I was waiting for you! Great! Have Jim cook up the old recipe & let us know what you think. On the butter, Geri says use whatever butter substitute you use or eliminate it all-together. Our original recipe way back when had no butter in it! More recipes will come..trying to spread them out between other posts. But this has been the most popular post by far with 109 hits yesterday & 25+ today last I checked… 25 from UK, 3 Hungary, & 1 Czech Republic!!!! Go figure, as they say! Must be at 1200-1300 hits with 9 posts in total. Thanks & tell us what you think of the recipe. To us it’s a party time/fun dish! Phil & Geri too! Phil, this is great recipe! I would love to try it – and looking at the image and how it was made, I can tell the taste must be spectacular! Thank you!! Linguine and white clam sauce is my “comfort food.” I use 12 fresh wild-caught littlenecks (Wegmans actually gets them from the Jersey Shore) which I steam in water, and white wine. Garlic, parsley, black pepper, extra-virgin olive oil, and if I’m in need of a slight kick, dried red (hot) pepper flakes. Thanks for this post, Phil & Happy New Year! Happy New Year……we just finished our lobstah…..but the clam recipe is perfect….I do like using first press olive oil and where is the Italian bread?